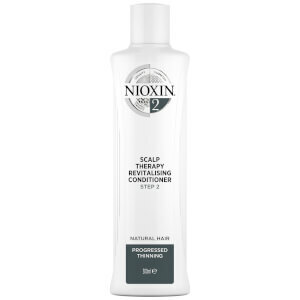 Strengthen, thicken and optimise thinning locks with the NIOXIN 3-Part System 2 Scalp Therapy Revitalizing Conditioner; a density-protecting and nourishing hair conditioner that helps to retain moisture balance, providing hair resilience to natural hair with progressed thinning. Enriched with Activ-Renewal Technology to help remove follicle-clogging sebum, fatty acids and environmental residue from the scalp and hair, the thickening formula unleashes the volumising powers of Bioamp and Scalp Access Delivery 2.0. These two technologies work in tandem to improve thickness, control moisture balance, boost strength and deliver UV-protection. Apply from scalp to ends. Leave-in for 1 to 3 minutes before rinsing. Aqua, Cetyl Alcohol, Stearamidopropyl Dimethylamine, Quaternium-18, Stearyl Alcohol, Bis-Aminopropyl Dimethicone, Hydroxyethylcellulose, Phenoxyethanol, Benzyl Alcohol, Cetearyl Alcohol, Mentha Piperita Oil, Mentha Arvensis Leaf Oil, Menthol, Glyceryl Stearate, Oleyl Alcohol, Methylparaben, PEG-2M, Propylparaben, Polysorbate 60, EDTA, Propylene Glycol, Citric Acid, Limonene, Camellia Sinensis Leaf Extract, Silica, Cystine Bis-PG-Propyl Silanetriol, Biotin, Lecithin, Niacinamide, Panthenol, Tocopheryl Acetate, Citrus Paradisi Peel Extract, Humulus Lupulus Flower Extract, Urtica Dioica Leaf Extract, Faex Extract, BHT, Acer Saccharum Extract, Citrus Limon Peel Extract, Saccharum Officinarum Extract, Vaccinium Myrtillus Leaf Extract, Citrus Aurantium Dulcis Fruit Extract, CI 42090, Potassium Sorbate, Sodium Benzoate.